1(a) State and prove varignones theorem. 1(b) Find the resultant of the force system shown in fig. 1(c) Find the co-ordinate of the centroid of the area shown in fig. 1(d) A force of 500N is acting on a black of 50Kg mass resting on a horizontal surface as shown in fig. 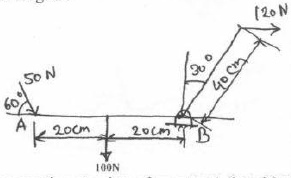 Determine the velocity after the block has traveled a distance of 10m. Coeff. of kinetic friction = 0.5. 1(e) The position vector of a particle which moves in the X-Y plane is given by $\bar r = (3t^3 - 4t^2)i + (0.5t^4)J m.$ Calculate velocity and acceleration at t=1 sec. 2(a) Find the resultant of the force acting on the bell crank level shown. Also locate its position write hinge B. 2(b) Determine the reaction at points of constant 1,2 and 3. Assume smooth surfaces. 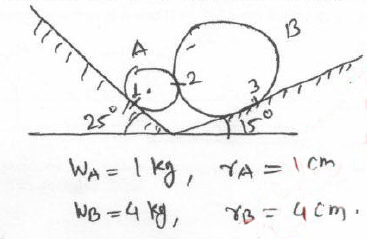 2(c) Two balls having 20Kg and 30Kg masses are moving towards each other with velocities of 10m/s and 5m/s respectively as shown in fig. 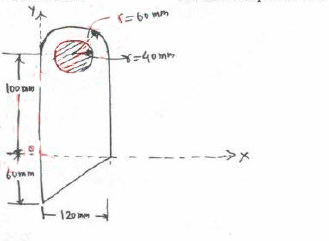 If other impact the ball having 30Kg mass is moving with 6m/s velocity to the right then determine the coefficient of restitution between the two balls. 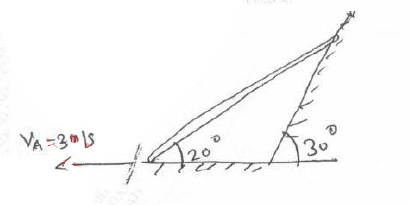 3(a) Determine the centroid of the plant lamina shaded portion is removed. 3(b) Explain conditions for equilibrium for forces in spaces. 3(c) A 30N block is released from rest. If slides down a rough incline having coefficient of friction 0.25. Determine the maximum compression of the spring. 4(a) Find the support reaction at A and B for the beam loaded as shown in fig. 4(b) The V-X graph of a rectilinear moving particle is shown. 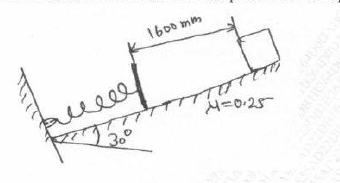 Find acceleration of the particle at 20m, 80m, and 200m. 4(c) A bar AB 2m long slides down the plane as shown. The end A slides on the horizontal floor with a velocity of 3m/s. 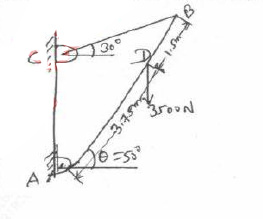 Determine the angular velocity of the rod AB and the velocity of end B for the position shown. iii) Forces in members FE and DC by method of section. iv) Forces in other members by method of joints. 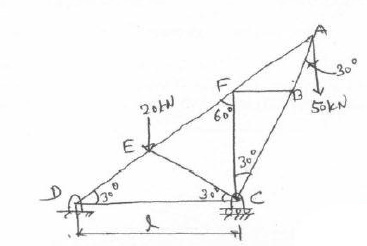 5(b) Determine the force 10 required to move the block A of 5000N weight up the inclined plane, coefficient of friction between all contact surfaces is 0.25. Neglect the weight of the wedge and the wedge angle is 15 degrees. 5(c) Determine the tension in a cable BC shown in fig by virtual work method. 6(a) A 500N crate kept on the top of a $15^0$ sloping surface is pushed down the plane with an initial velocity of 20m/s. If $\mu s = 0.5$ and $\mu k = 0.4$. Determine the distance travelled by the block and the time it will take as it comes to rest. 6(b) Derive the equation of the path of a prosotile and hence show that the path traced by a prosectile is a parabolic curve. 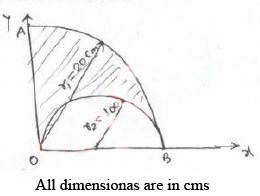 Find ratio of curvature when t = 2 sec. 6(d) A force of 100N acts at a point P(-2, 3, 5) m has its line of action passing through Q(10,3,4)m . Calculate moment of this force about origin (0,0,0).